Suffolk County police say that a squad car with two officers aboard was responding to an emergency call on Long Island when it struck a pedestrian who later died. Police said in a release that the department was seeking witnesses to the 10:34 p.m. crash Saturday on Main Street in Islip. The accident resulted in 54-year-old Craig Schiffer's death. The East Meadow resident was taken to Southside Hospital in Bay Shore, where he was later pronounced dead. Police said the patrol car was responding to a 911 call in East Islip at the time. The vehicle was impounded for a safety check. No one else was injured in the crash. 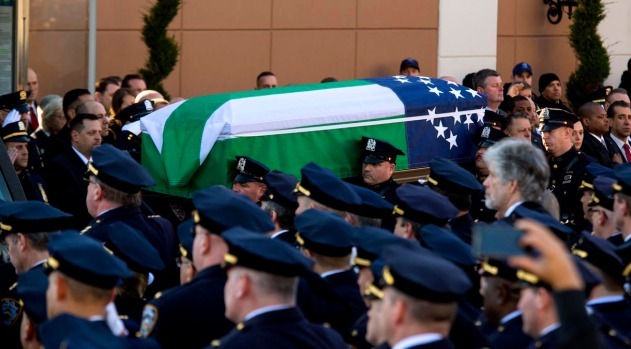 Slain NYPD Officer Rafael Ramos Was "Cop for All the Right Reasons"
NYPD officer Rafael Ramos, shot to death last week with his partner in their patrol car, was remembered as a selfless man while being mourned by thousands of officers from across the country attending in solidarity.